Who else here loves breakfast and brunch foods? (I hope you have both hands raised in the air, waving wildly.) No matter the time of day, I’m always in the mood for eggs. And potatoes. And cheese. 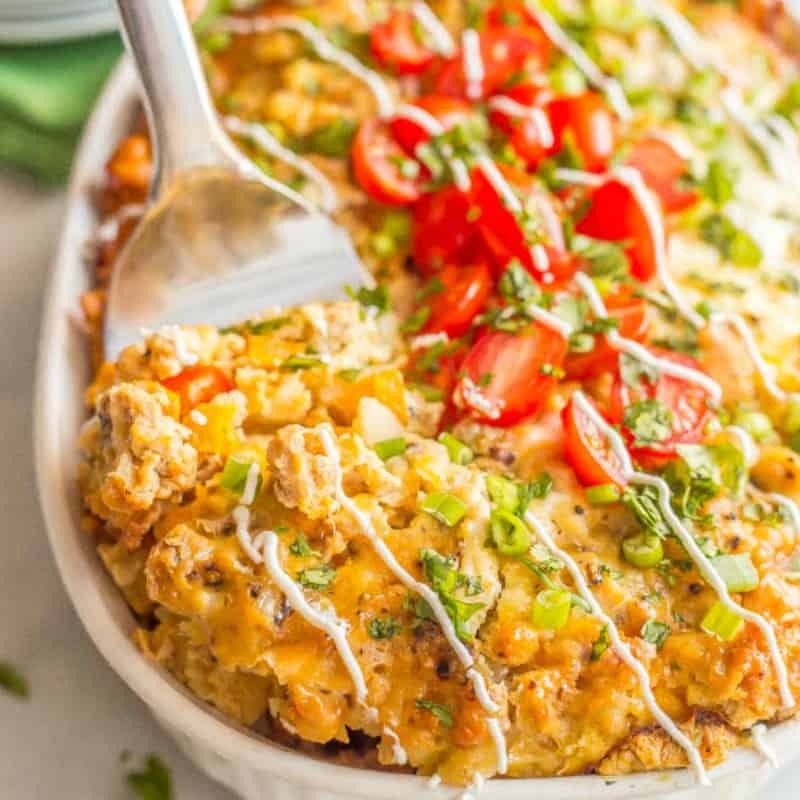 This Overnight Crock Pot Breakfast Casserole brings together some of my favorites and is the perfect thing to make when you’ve got family in town or friends coming over for brunch. I love that it’s ready to go and waiting for me in the morning. Let’s me focus on getting everything else tidied up and ready to serve. 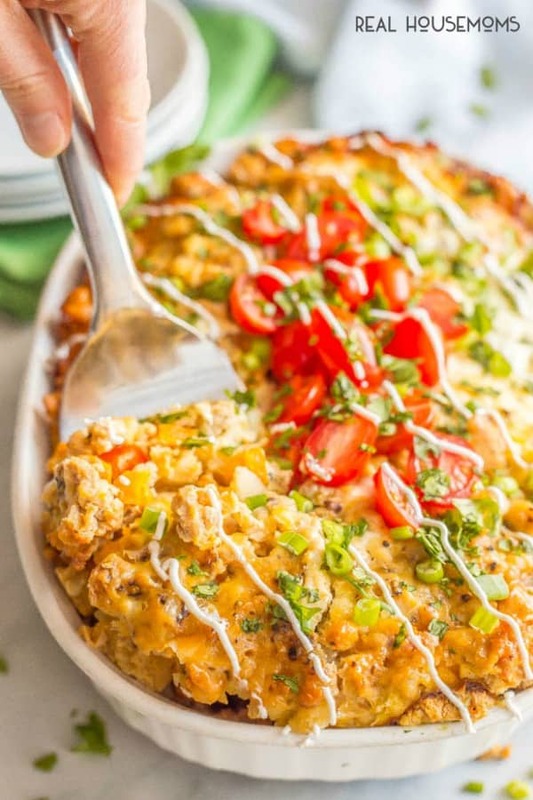 This breakfast casserole is also very customizable. You can use turkey sausage like I do here – either hot or mild – or substitute pork sausage or even ham or bacon. You can switch up the cheese too. Monterey Jack or Pepper Jack would be great. You can even add some red pepper flakes or diced jalapeño if you like a little heat. 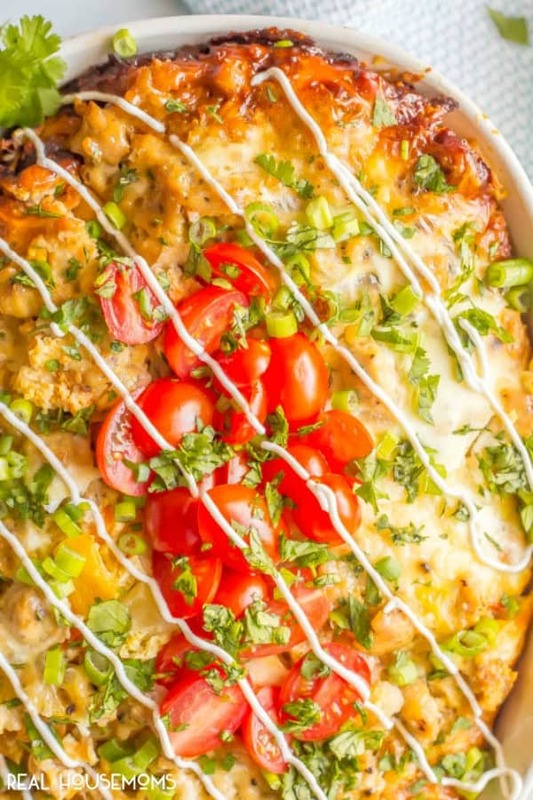 And if you don’t want to be fussing with this crock pot overnight breakfast casserole much at night before, you can chop the veggies and cook the sausage earlier in the day. Then you just need to layer everything in the crock pot and turn it on! Ta-da! Breakfast will be ready and waiting for you in the morning. And the delicious smells will usher your whole family to the kitchen to dig in! So whether you’ve got family in town, overnight guests, holiday visitors or just want a fantastic breakfast that cooks itself, I hope you give this overnight crock pot breakfast casserole a try! Need some side dishes to round out your brunch? Check out my overnight cheesy grits casserole (a Southern favorite!) and my mixed greens salad with fruit for a fresh and healthy side. Want more breakfast casserole recipes? Place the chopped onion and peppers on top of the potatoes. Next, layer the cooked sausage in the crock pot and top with the shredded cheese. In a medium bowl, whisk together the eggs and remaining ingredients (but not the toppings). Pour the egg mixture over the other ingredients in the slow cooker. Put the lid on and cook for 8-9 hours on low. If you are using thawed hash brown potatoes, this will probably cook in 7-8 hours. You can substitute pork sausage if you prefer. You could also replace the sausage with diced ham or cooked, crumbled bacon. I use skim or 2% milk, but you could use a milk substitute or use half-and-half for a richer dish. 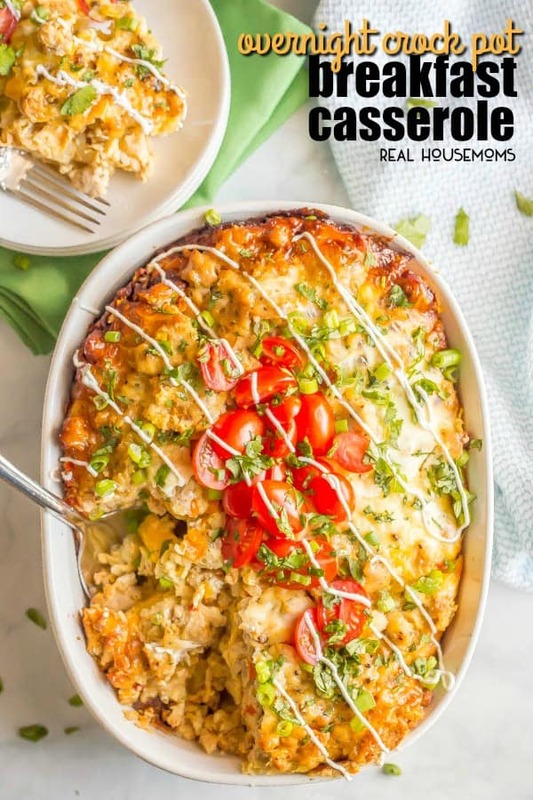 The toppings are optional but really help make this casserole look gorgeous and bring a bright, fresh taste as well. I made this last Christmas & it did not turn out good. The hash browns made it very dry, couldn’t even tell it was an egg casserole with cheese. I had high hopes cause I had a lot of people to feed. I’m sorry to hear that. Hopefully you will try it again but maybe make a couple changes, try using a bit more egg. The toppings also really help to enhance the flavors so don’t be afraid to encourage the use of the extras. Thanks for trying the recipe out! Hello can you use fresh grated potatoes instead of frozen? Yes, there is just a bit more work involved with using freshly grated potatoes. There is a lot of water content when you freshly grate them so just be sure to squeeze them out as much as possible. Am I able to double this recipe? Or is it too much? It will yield quite a bit when doubled, so it mostly just depends on how much you need. This is good for a 5-6 quart crock pot. Check out the link in the post to find out which one we like best! Have used this recipe. Found the leftovers make great breakfast burritos.. freeze well. Great way to make it feel like you’re not eating the same ol thing the next day! Nice work and thank you. It looks delicious! However, I don’t understand how you serve this for breakfast when it cooks for 4 hours. What time do you people get up in the morning?! And you can’t put it on a timer because it has eggs and milk. I might be confused on what you’re referring to, the recipe instructions call for a cook time of 8 hours in your slow cooker on low. Can I cook on high for half the time? Good question, I’ve never actually tried that myself! Worth a try, just remember to try and keep an eye on it experiment with it and let us know how it turns out. Hi! Instead of layering the ingredients, could you go ahead and combine everything in a big bowl and then cook that mixture in the slow cooker? Or would that be too mushy? Thanks for sharing your ideas! You may have a little bit of a mush factor but it shouldn’t cause too much of an issue. Layering it helps to set it up but in the end, mixing it all together should yield the same flavors! Can I double this recipe and still use the 5-6 quart crock pot? I’m not sure I would recommend truly doubling as this recipe as it pretty well fills up the Crockpot, it may cause an overflow situation as well as longer cooking time. Hi, can I just mix all the ingredients in my blender on turtle speed and then microwave for 12-15 minutes instead of using the crockpot? lol kidding. Recipe came out burnt and dry. I should have known 9 hours was too long, but when your putting it together at midnight it’s hard to think clearly. I highly recommend that you adjust the cooking time on the recipe so others don’t waste their time and money like I did. While we definitely hate to hear that your experience with this recipe didn’t go as planned we definitely appreciate the feedback. Unfortunately, slow cookers are a lot like ovens and it’s better to be cautious. The recommendation is for 8-9 hours so always better to check at the earlier mark than the later, although the time placed on the recipe is what worked when making it in our kitchens. Also, the difference between frozen and thawed potatoes is huge as well environment (higher elevation, drier climate things like that). I hope the next recipe works out well for you, thank you! Wonderful! I made this for my co workers, and 8 hours on low was perfect. I did spray my crock with cooking spray to ensure that the potatoes would not stick. I used pork sausage instead of turkey sausage, red, yellow and orange peppers, and left out the pepper flakes. My co workers all complimented the casserole. A couple asked for the recipe too! This recipe is definitely a keeper! Thank you so much for sharing that! I love when I find something that is a hit for everyone.